Excessive Drinking in Dogs - How To Deal With Polydipsia in Dogs? Excessive Drinking in Dogs – How To Deal With Polydipsia in Dogs? Excessive drinking in dogs may seem harmless, but consider this: if your dogbegan eating far more than normal, wouldn’t you be alarmed? 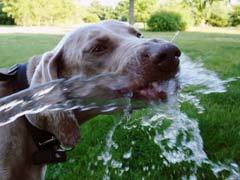 A sudden, inexplicable, excessive thirst in dogs is cause for concern because what it can mean. The condition is known as polydipsia, but it less a disease and more of a signal of other, more serious problems in your pet’s health. When it seems your pet is seeking every water source available or emptying his water dish at a much faster rate than normal, first make absolutely certain this behavior is new and not easily explained by outside stimuli. A sudden change in weather to warm conditions is a more mundane explanation for excessive drinking in dogs. Also, closely monitor just how often your dog is drinking, taking care not to leave alternative water sources available—such as dripping sinks or toilets with their lids open. Another important step to determining if something may be wrong is to watch for other symptoms. Excessive panting in dogs can mean something is amiss, along with depression or lack of eating. Once you have determined your dog is in fact suffering from polydipsia then the dog is probably also showing signs of polyuria—too frequent urination. Your vet can run tests to determine the dog incontinence causes. The conditions that can cause excessive urination or excessive drinking in dogs include kidney disorders, high blood calcium concentration, diabetes mellitus, or canine Cushing’s disease. Considering the great number of disorders or illnesses excessive drinking in dogs can mean, always watch for other symptoms in your dog’s appearance or behavior that can help your vet determine the cause.